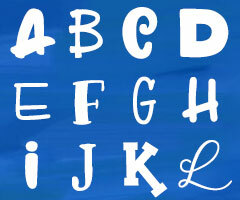 My attention was directed today to Your Fonts, a site that will generate your own handwriting as a font for FREE. I’ve made several handwriting fonts in the past, but it’s been a labor-intensive process of drawing/editing each character, then compiling them in a font creation program. This was much quicker and easier. They give you a template to print out. You fill in each letter and character. Scan it back in, upload it, and in a trice, you have a font of your handwriting! It took maybe 15 minutes total to do the whole thing, and the most time-consuming part was writing in all of the letters.